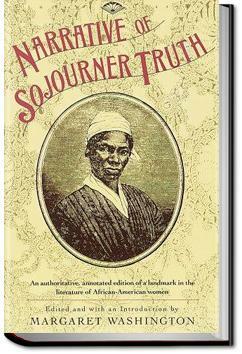 The Narrative of Sojourner Truth is the gripping autobiographical account of Sojourner Truth's life as a slave in pre-Civil War New York State, and her eventual escape to Freedom. Since Sojourner could neither read or write, she dictated her story to Olive Gilbert after they met at a Women’s Rights rally. The Narrative was widely distributed by the Abolitionist Movement. It was one of the catalysts for the rise of anti-slavery public opinion in the years leading up to the Civil War. Though Olive Gilbert's writing about Sojourner takes on a patronizing tone at times (a weakness of some Abolitionists), The Narrative of Sojourner Truth remains a moving and historic document, chronicling the struggles of African-Americans under slavery and the life of a truly remarkable woman. . . .deed for him, in that last dread of hour of need! The news of his death reached the ears of John Ardinburgh, a grandson of the old Colonel; and he declared that 'Bomefree, who had ever been a kind and faithful slave, should now have a good funeral.' And now, gentle reader, what think you constituted a good funeral? Answer-some black paint for the coffin, and-a jug of ardent spirits! What a compensation for a life of toil, of patient submission to repeated robberies of the most aggravated kind, and, also, far more than murderous neglect!! Mankind often vainly attempts to atone for unkindness or cruelty to the living, by honoring the same after death; but John Ardinburgh undoubtably meant his pot of paint and jug of whisky should act as an opiate on his slaves, rather than on his own seared conscience. COMMENCEMENT OF ISABELLA'S TRIALS IN LIFE. What an inspiring individual! She had courage, compassion and a compelling drive to get things done. A great story...all the greater because it is true. There is a special place in heaven reserved for people like Sojourner Truth. Sojourner Truth had to be one of the most charismatic people ever to walk the Earth. * Charisma is hard to convey in any mode that's not face-to-face. This book might be as close to capturing raw charisma as I have ever seen. She stands out even in an era of incredibly charismatic people. Sometimes reading a book isn’t about pleasure, but rather a way to show respect for someone life, struggle or ideas. Sojourner Truth deserves to have her story read. She was a bold woman who lived with fearless integrity. Beautifully written and a pleasure to read even though the truth it tells is difficult to admit. This should be required reading in junior high or middle school as it is called in some parts of the U.S.A.